I’ve been reading about Standing Desks for a while, and decided to take the plunge over the Christmas break. I was initially impressed by Colin Nederkoorn’s standing desk for $22, and then also came across this IKEA variant by Benson Chou. Since my screen is a 21.5″ iMac, I decided that the 55 cm height of the Lack side table was going to raise the whole thing too high. Instead, like Jinyoung Kim, I went for the Lack coffee table, which is slightly lower at 45 cm, as well as being wider and possessing a middle shelf. Just for fun, I also changed the shelf brackets to the Ekby Bjärnum, and bought an Ekby Järpen shelf to go with it. Although putting it all together was relatively straightforward, I bumped against a few things that are potential gotchas. Like Benson Chou, I screwed the brackets to the front legs before attaching the latter to the table top. However, I didn’t really pay proper attention to two things. First, the legs are oriented, in the sense that there is a pre-drilled hole at one end. So you need to take this into account in measuring the height of the bracket. Second, it’s difficult to predict how many turns will be required to get the leg to fix snugly against the underside of the table top. (The two are joined by a double-ended screw.) It follows that you don’t really know which face of the leg would optimally face forward to receive the bracket. So probably the best thing is to screw in the two legs, mark the front face, unscrew and attach the bracket, then re-attach. This helped to a certain extent, but was far from perfect, mainly because the plugs are designed for a thicker wall. If I was doing this again, I would adopt Jinyoung Kim’s solution of bolts, washers and nuts, which would definitely be more robust. It is also helpful to notice that the brackets have holes on one side; these take grub screws to ensure that the shelf is firmly lodged in the brackets. So obviously you want to make sure that the side with the holes is on the underneath. Since the shelf is 119 cm long, while the coffee table is 90 cm long, I had to chop a chunk off the shelf. Three days later, I’m still feeling my way with the experience of standing. Overall, I feel positive about it. Standing up certainly encourages focussing on the task at hand, and goes well with the pomodoro technique, since I can time my stints of standing to 25 minutes. However, I’m also finding it physically quite demanding, which probably suggests that I need to keep on working on my posture. In my blog post on finding commodity terms for Trading Consequences, I described how one of the project’s tasks was to carry out Named Entity Recognition of commodities in digitised historical texts. In this post, I want to describe in a bit more technical detail some of the steps we have been taking to carry out this task. Warning: this is not a distilled set of take-away lessons, but more of in-progress log. We decided initially that we should construct a thesaurus which would use relevant terms from an existing vocabulary and supplement it with more obscure or archaic terms that were discovered in the course of reviewing relevant historical documents. An important design consideration was to include a limited amount of hierarchical structure in order to support querying, both in the database interface and also in the visualisation process. For example, it ought be possible to summarise the export of limes, apples and oranges under the label Fruit. We also wanted to be able to add other properties to terms, such as noting that both nuts and whales are a SourceOf Oil. Finally, it was important to be able to list multiple alternative forms for the same commodity; for example, rubber might be referred to in several ways, including not just “rubber” but also “India rubber”, “caoutchouc” and “caouchouc”. These factors made SKOS (Simple Knowledge Organization System) an obvious choice of framework for organising the thesaurus. We can read the bottom part of this diagram as saying that the concept Mammals ‘has a broader concept’ Animals. 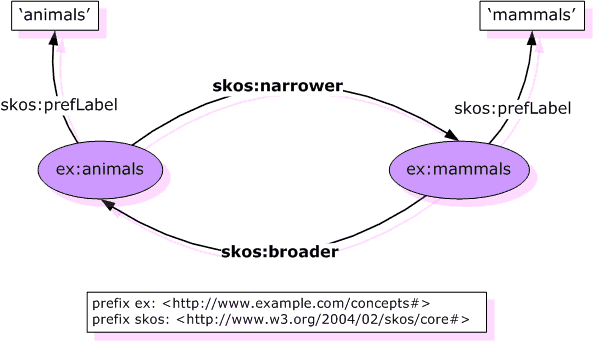 Although skos:broader is not transitive, SKOS also contains the property skos:broaderTransitive, which is, and this is what we will be using. A concept in SKOS is explicitly intended to be a fuzzier notion than a class of things. Nevertheless, we’ll be using concepts as though they were classes, and consequently, ex:mammals skos:broaderTransitive ex:animals is effectively equivalent to saying that Mammals is a subclass of Animals. I looked at existing vocabularies already represented in SKOS which could be taken as a starting point. I decided, without a huge amount of investigation, to take the UMBEL upper ontology as the starting point for our base vocabulary. It seems big enough to provide a good basis, and is small enough (just under 120Mb) to download from github. After poking around looking at the file structure, it seemed that everything we wanted was contained in umbel_reference_concepts.n3. Note that this an RDF file, serialised in Notation 3 format (best thought of as Turtle, which is a subset of Notation 3 that has become the de facto alternative to RDF/XML). The data model for RDF is a graph in which ‘subjects’ are related by properties to ‘objects’. While UMBEL uses SKOS concepts and properties, it supplements these with selected properties from the RDF Schema language (RDFS; see http://www.w3.org/TR/rdf-schema/). Trying to get an overview of what was in UMBEL was an initial challenge. Although I spent a little time looking at SKOS editing tools, nothing stood out as an obvious contender in terms of ease-of-installation, broad adoption and relevant functionality. However the Free Edition of TopBraid Composer worked well for browsing umbel_reference_concepts.n3. The following screenshot illustrates the interface. In a follow-up post, I will describe how we are converting this additional set of terms into a SKOS-compatible form, and how we are integrating it with the base vocabulary from UMBEL. Separate Clouds Blog by Ewan Klein is licensed under a Creative Commons Attribution-ShareAlike 3.0 Unported License.